This is good inspiration for those who have 4 season weather countries, and have precious plants which comes from tropical areas that needs to be kept inside the house during cold weather to thwart the plants from dying. It's pleasant to have them within your home, to release more oxygen in the residence in exchange of the carbon dioxide that we discharge. However, we must ensure that our living room, or kitchen or which part of the house we put them in must look organized and nice too in order to prevent from a clutter look locale. Have a few ideas on how you can relate an indoor landscaping as well as to make your potted plants and yourself comfortable temporarily. 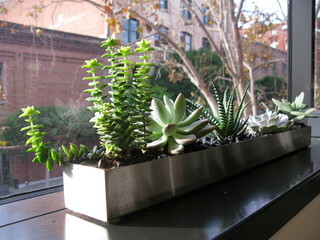 I hope that his images would inspire you to find spots for your indoor plants inside your home. I love indoor plants, I have some at home. It purifies the air inside. I want to have plants inside our house, but all I can manage is a Chinese bamboo, which is almost dying. I have to try planting some aloe vera this year.